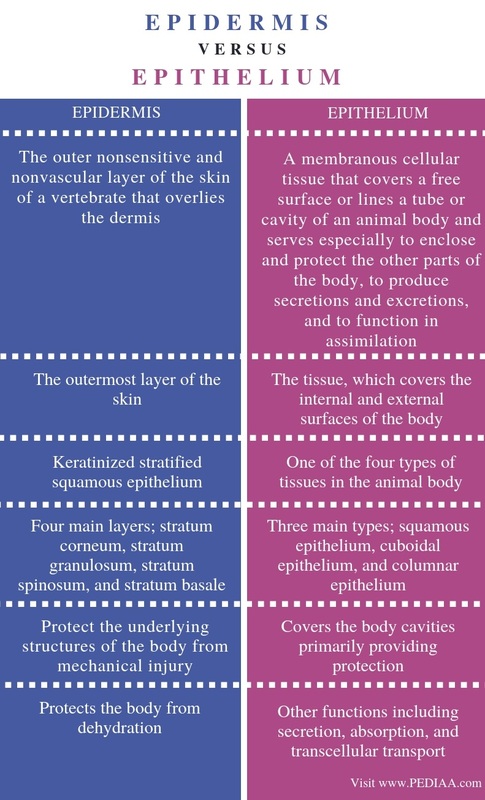 The main difference between epidermis and epithelium is that epidermis is the outermost protective layer of the skin of animals whereas epithelium is one of the four types of tissues in the animal body, which lines the internal and external surfaces of the body. Furthermore, the epidermis is a type of epithelial tissue, primarily responsible for protection, while epithelium covers parts of the body, providing protection. Moreover, the epithelium is responsible for secretion and absorption. Epidermis and epithelium are two anatomical structures which cover the body, providing protection. The epidermis is the outermost layer of the skin whose inner layer is the dermis. It is composed of the keratinized stratified squamous epithelium. It lacks blood vessels; hence, it obtains nutrients through diffusion from the dermis. The main function of the epidermis is to protect the underlying structures from mechanical injury or trauma, dehydration, and infection. Based on the location, four to five layers of the epidermis can be identified. They are stratum corneum, stratum lucidum, stratum granulosum, stratum spinosum, and stratum germinativum/ basale. 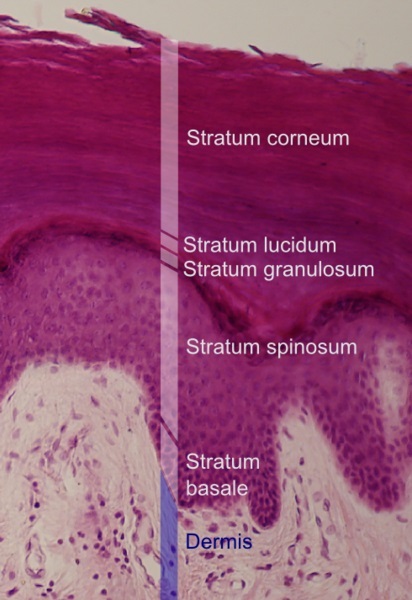 Stratum germinativum/ basale (germinal or basal layer) – this is a single layer of cells closest to the dermis. The cells in this layer divide to produce the upper cell layer. Stratum spinosum (spinous layer) – this represents the 8-10 layers above the germinal layer. The cells of this layer contain a number of desmosomes and thick intermediate filaments. Stratum granulosum (granular layer) – this represents the 3-5 layers above the spinous layer. The cells of this layer do not contain nuclei and other cytoplasmic organelles. They contain granules, which secrete lipids, the water sealants. Stratum lucidum (clear/translucent layer) – this is a thin, transparent layer found only on the palms and soles, forming the ‘thick skin’. Stratum corneum (cornified layer) – this represents the outermost layer of the skin. It contains dead, flattened, scale-like cells, which are keratinized. In plants, epidermis refers to the outermost cell layer, which covers the plant body including leaves, stem, and root. The three types of cells in the plant epidermis are epidermal cells, guard cells, and trichomes. Epidermal cells secrete the cuticle layer, which prevents water loss. Guard cells form stomata responsible for the gas exchange. Also, trichomes are the hair-like extensions of the epidermis. The epithelium is one of the four types of animal tissues. The main function of epithelium is to cover the internal and external surfaces of the body. Generally, the structure of the epithelium contains epithelial cells rested on the basement membrane. Moreover, blood vessels or nerves do not occur in between the epithelial cell layers. However, some epithelial cells give rise to glands. Also, some of the other functions of the epithelium are the secretion, absorption, and transcellular transport through cell junctions, especially desmosomes. Moreover, epithelial cells can have three principle shapes: squamous, cuboidal, and columnar. Squamous cells are wider and have a flat, scale-like structure. On the other hand, cuboidal cells have the same height and width. But, columnar cells are taller. Besides, two arrangements of epithelial cells on the basement membrane can be identified; simple and stratified epithelium. Here, simple epithelium has a single cell layer on the basement membrane while stratified epithelium has several epithelial cell layers on the basement membrane. Based on the number of cell layers, the shape of the epithelial cells, and the location of the epithelium, different types of epithelia have different specific functions. Epidermis and epithelium are two structures, which covers the body. Both contain epithelial cells rested on a basement membrane. Also, both are nonvascular and nonsensitive layers. Besides, their primary function is to provide protection. Epidermis refers to the outer nonsensitive and nonvascular layer of the skin of a vertebrate that overlies the dermis. Epithelium refers to a membranous cellular tissue that covers a free surface or lines a tube or cavity of an animal body and serves especially to enclose and protect the other parts of the body, to produce secretions and excretions, and to function in assimilation. 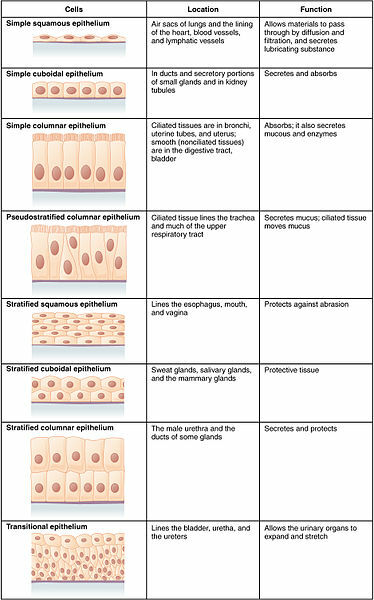 Thus, these definitions explain the fundamental difference between epidermis and epithelium. Accordingly, the main difference between epidermis and epithelium is that the epidermis is the outermost layer of the skin while epithelium is the tissue which covers the internal and external surfaces of the body. Another difference between epidermis and epithelium is that the epidermis is made up of keratinized stratified squamous epithelium while epithelium is one of the four types of tissues in the animal body. The four main layers of the epidermis are stratum corneum, stratum granulosum, stratum spinosum, and stratum basale while the three main types of epithelium are squamous epithelium, cuboidal epithelium, and columnar epithelium. Furthermore, their functions contribute to another important difference between epidermis and epithelium. The main function of the epidermis is to protect the underlying structures of the body from mechanical injury while epithelium covers body cavities, primarily providing protection. Moreover, one other functional difference between epidermis and epithelium is that the epidermis protects the body from dehydration while epithelium has other functions including secretion, absorption, and transcellular transport. The epidermis is the outermost layer of the skin, composed of the keratinized, stratified squamous epithelium. It is responsible for protecting the underlying structures from mechanical injury and dehydration. In comparison, the epithelium is one of the four types of tissues in the body. It covers the internal and external structures while providing protection. Other functions of the epithelium include secretion, absorption, and transcellular transport. However, the main difference between epidermis and epithelium is their location, structure, and function. 1. “Layers in the Epidermis.” Histology Guide, The Leeds Histology Guide, 1 Jan. 1970, Available Here. 2. “Epithelial Tissue|Boundless Anatomy and Physiology.” Lumen Learning, Lumen, Available Here.